Why does the variation in coffee processing matter? You drink your morning cup of coffee and wonder how a bright red cherry became a roasted bean that made such a delicious drink. You wonder about the farmers that picked the coffee, processed the coffee, and the roaster who roasted it. Behind every roasted bean is a story about processing, which is the method of removing the cherry and drying the seed to send to roasters as “green” coffee. There are 3 common ways to process newly picked coffee; Washed, Natural, and Pulped Natural. All of which, affect the final taste in the cup. The first I want to discuss is the Washed processing method. This method is the quickest in time before it reaches the U.S. In all high quality coffee, the farmers are out in the fields every single day picking only the ripe coffee cherries. If the cherries are not ripe, then they are left to ripen. Once they are picked, the processor then hulls the cherry from the seed. After separation, the seeds are left with mucus that is made up of a complex of pectin and sugars. At this point the mucilage needs to come off of the seed, for certain coffees, and there are two different types of fermentation; dry and wet. For dry fermentation, the seeds sit in a large tank for 18-36 hours. For instance, our La Armonia coffee from Guatemala uses this method to ferment. For wet, the seeds sit in a tank with water for the same amount of time. This is mainly found in Kenyan coffees, like our Kenya Ruthagati that we offer. After the fermentation, the coffee is then washed to remove any left over mucilage. Once the seeds are washed, they are dried on raised beds or patios for a few days. In a cup of coffee that has been washed, the drinker will find that the cup is cleaner, brighter, and fruitier. This process is very particular and the point of it is to have the seed drying without the mucilage because the pectin and sugars would cause different characteristics than desired. The Washed method is generally preferred for high quality coffees. The next method is the Natural process. This method is often used in countries where rainfall is scarce and long periods of sunshine are available during the growing season. For example, our Amaro Gayo from Ethiopia is offered in a Natural. 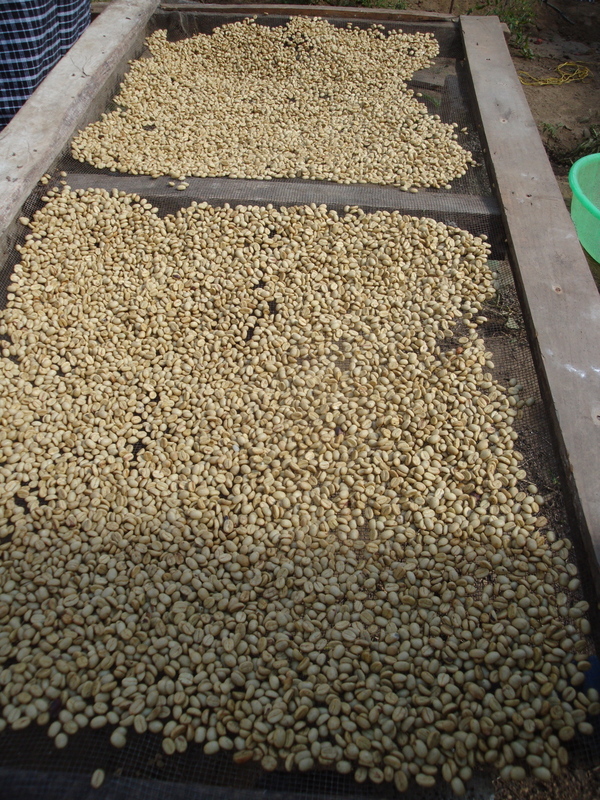 During this method, instead of hulling and washing the coffee, the coffee cherries are picked and laid out to dry. The drying period for this processing method is a few weeks because the cherry and the seed inside of it need to be completely dry before it is hulled. The Natural process is not labor intensive and there is room for mistake. It becomes easier for fungus and over fermentation to invade the coffee cherries. Since the cherry is still on the seed during the drying process, the seed will inherit characteristics from the skin that make the coffee heavier in body, sweeter, and more complex, much like our Amaro Gayo from Ethiopia. The last method that I want to mention is called Pulped Natural or Honey Prep. This meets the two disparate methods in the middle, where the processor will hull the cherry from the seed, however, instead of washing the coffee, will dry it with the mucilage still on. This method can only be done in countries where humidity is low and the seeds can be dried rapidly without fermenting. Pulped Natural mainly happens in Brazil, where the coffees are cleaner and have a brighter acidity, which are made from the seed allowing the pectin and sugars from the mucilage to create characteristics. The method that is most commonly found in higher quality coffees is the Washed method. Our Ethiopian Amaro Gayo Washed is a great example of this method as it is very clean and transparent tasting with floral, citrus, and orange marmalade flavors and a very nice, bright acidity. The other two methods are not as commonly used, however, they are accepted in Specialty Coffee because they bring something different to the table. For example, our Ethiopian Amaro Gayo Natural, which has the characteristic fuller body, sweetness and fruit notes of a natural processed coffee. We really find it to be full of blueberry, shortbread, and port wine character. They are the same coffees from Ethiopia, just processed differently, which creates a huge difference in flavor profiles. Setting the two coffees side by side at your café for customers, or even at home for your own enjoyment, can be a fun exercise to practice the taste differentiation between the two processes.